At places like Walt Disney World and the Smithsonian National Museum of American History, more than four million people have viewed The Kinsey Collection's artifacts, manuscripts, books and art documenting African American history. Soon, the collection, comprising one of the largest private collections of African American pieces in the world, will make its first visit to the Magnolia State at Mississippi State University. 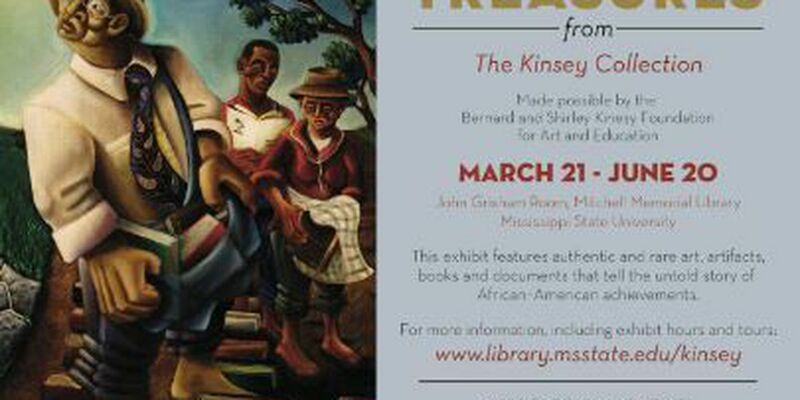 Free, public viewings of The Kinsey Collection's "African American Treasures" will be open March 21-June 20 in the John Grisham Room at Mitchell Memorial Library. Because the collection is private, not a permanent public display, viewing "African American Treasures" is a once-in-a-lifetime opportunity, according to organizers. They suggest residents, schools and media make plans to see the pieces during its short three-month visit. Pieces in The Kinsey Collection, owned by Bernard and Shirley Kinsey of Los Angeles, celebrate African Americans' achievements and accomplishments throughout U.S. history, especially through their impacts on culture and art. Highlights of the "African American Treasures" display coming to MSU include an early copy of the Emancipation Proclamation and a signed copy of Brown v. Board of Education. Also, rare works from early 19th century African American artists will be displayed. "This is a fabulous exhibit that will be coming to Mitchell Memorial Library, and we're excited about all the great opportunities it offers in support of teaching and research," said MSU Libraries Dean Frances Coleman. "It will benefit – and teach – the students, faculty and the general public." The Kinsey family, including son Khalil, will visit campus to celebrate the opening of The Kinsey Collection at MSU. Bernard Kinsey will speak at a 3 p.m. public presentation on March 22 to offer insights into the respective pieces on display at the university, as well as why he and his wife are so passionate about gathering items for the collection. "What The Kinsey Collection does is put the 'African' in the story of American history," he said. "This is the story of a people who did so much with so little, and this collection begins to fill in the blanks, trying to give those people a voice, a personality and a name." The collection is presented by the Bernard and Shirley Kinsey Foundation for Art and Education. The organization seeks to educate the public about African American history by highlighting African American accomplishments over time, closing societal and cultural gaps between African Americans and other populations, and eroding the stereotypes undercutting equality. Bernard Kinsey, former vice president of Xerox Corp., and Shirley, former teacher, began the collection in the mid-1980s when Khalil brought home a third-grade homework assignment to research his family history. When the family couldn't trace their family roots past their grandparents, the Kinseys began acquiring art and manuscript pieces to fill the gaps, not only in their own family history, but in African American culture as a whole. Their efforts have resulted in a collection spanning more than 400 years of African American culture. Shirley said she never wanted the collection to focus on the struggles of African Americans; instead, The Kinsey Collection focuses on their achievements and accomplishments. For the Kinseys, the key to a unified and equal future begins with recognizing the successes of the past. As Khalil grew up with an ever-expanding collection of African American historical pieces, his friends enjoyed coming to his home to visit and learn more about the collection, he said. "Speaking from personal experience, I can say that this collection has a transformative effect. The information contained in it challenges, inspires and gives broader context to our rich and complex history," Khalil said. Representatives of Visit Mississippi, a statewide tourism organization assisting in bringing The Kinsey Collection to MSU, agreed that visitors of all ages and races should visit MSU to see The Kinsey Collection. "The cultural assets that our colleges and universities in Mississippi can offer visitors is unparalleled. We are pleased to partner with Mississippi State University in bringing this impressive collection of African American treasures to our state," said Malcolm White, Visit Mississippi director. The exhibit is made possible by MSU Libraries, African American Studies at MSU and grants from Visit Mississippi, Starkville Visitors & Convention Council and the Mississippi Humanities Council, through support from the Mississippi Endowment for the Humanities. Any views, findings, conclusions or recommendations expressed in this exhibition do not necessarily represent those of the National Endowment for the Humanities or the Mississippi Humanities Council. To discover more, schedule group tours or view exhibit hours for "African American Treasures" from The Kinsey Collection at MSU, visit library.msstate.edu/Kinsey. More information about the Kinseys, The Kinsey Collection and its history is available at www.thekinseycollection.com. MSU, Mississippi's flagship research university, is online at www.msstate.edu, facebook.com/msstate, instagram.com/msstate, pinterest.com/msstate and twitter.com/msstate.